Events during the past have once again reminded me how fragile life is. But these same events have also reminded me how our spirit lives on even when our physical body doesn’t. C.S. Lewis is usually credited for the words “You don’t have a soul. 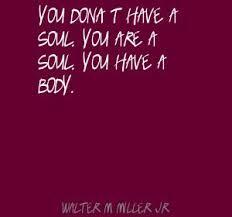 You are a soul. You have a body. Walter M. Miller actually wrote them. But despite who gets the credit, that quote is brilliant. Posted on February 3, 2014, in Family, My life, perspective and tagged 365 reasons to smile, musings, quotes, smies, spiirituality, thoguts. Bookmark the permalink. 21 Comments. I agree…. this is a fabulous quote!